Before ever leaving Portland I typed into google “how to rename your boat”. Primarily I was intending to find a form I had to fill out with the USCG (which there is… many of them actually) and maybe learn the best way to handpaint letters onto the hull(s). Well, let me save you some time- people don’t do that anymore. Vinyl lettering is apparently the thing nowadays. I did some photoshop mockups to figure out where, what font and how large we wanted the names to be- and then sent them to our printer before the drive cross country. Easy part down. Apparently it’s not the physical name removal (jen made that look easy) and replacement that are hard. The bigger deal is appeasing the gods of the sea. Thanks google… Why hadn’t I thought of that?! It’s no secret that sailors are a superstitious bunch. We’ve all heard the rules. 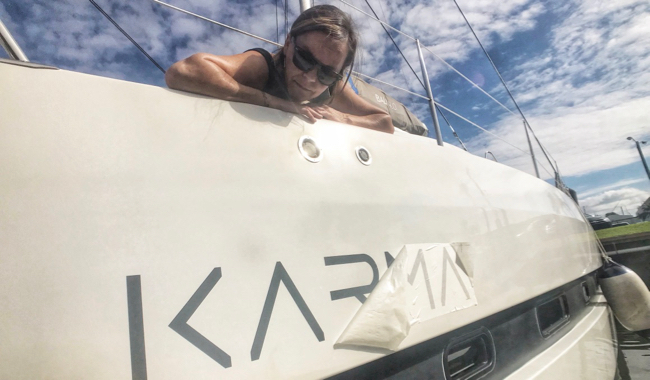 No bananas or whistling onboard, no sailing on certain days, no women on board (okay that’s just crazy), but apparently among the biggest rules of the sea is NEVER change the name of your boat! Well, with all due respect to Poseidon’s rules that just wasn’t going to work for us. 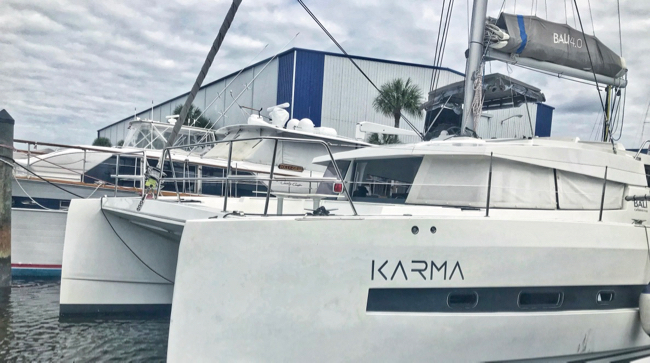 Long before we ever bought a boat we always knew the boat would be named Karma, in honor and namesake of our beloved pup, who back when we had these absurd discussions/dreams about buying a boat we assumed would not be around IF we ever found a way to make it happen. We wouldn’t really consider ourselves superstitious. We believe you chart you own course, are responsible for your own decisions and actions and mostly make your own luck… but we’re also in no place to allow any bad luck to creep in to this voyage- so we did what sailors have been doing for centuries - we used bad luck as an excuse to drink and threw a little party in honor of the gods! So… on with the traditional name change ceremony! According to legend, each and every boat in the sea is recorded by name in the “Ledger of the Deep” and is known personally to Poseidon, the god of the sea. SO whenever someone wants to change the name of their boat, the first thing do is to purge its name from that ledger and from Poseidon’s memory. This process began with us purging every trace of the boat’s old identity/name. Lucky for us, we’re pretty good at purging and were doing a deep clean anyway.. so every single mention of the old name went overboard (off the boat). Harder for us was making sure we didn’t bring any objects or records with the new name onto the boat prior to the ceremony. 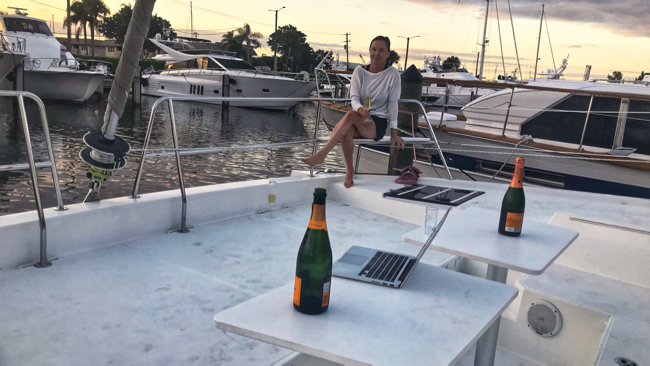 Right around happy hour (we wanted to make sure both we and Poseidon were available after a long day’s work we prepped for the ritual). We prepared a metal tag with the old name written on it in water-soluble ink and gathered a bottle of our best champagne, because of course Poseidon deserves only the best!! Oh mighty and great ruler of the seas and oceans, to whom all ships and we who venture upon your vast domain are required to pay homage, implore you in your graciousness to expunge for all time from your records and recollection the name ‘Alive’ which has ceased to be an entity in your kingdom. As proof thereof, we submit this ingot bearing her name to be corrupted through your powers and forever be purged from the sea. We then dropped the metal nameplate overboard for the sea do do it’s own purging work and proceeded to pour some bubbles overboard as tribute (followed of course by some for us so we could toast the ruler of the deep). In grateful acknowledgment of your munificence and dispensation, we offer these libations to your majesty and your court. Old name sufficiently purged (and while we still had the attention of a god) we went ahead with the naming ceremony. We had a second bottle of bubbles on hand because in this portion we were supposed to appease not only Poseidon but also the gods of the wind… and the last thing we want to do is short pour a god!! Oh mighty and great ruler of the seas and oceans, to whom all ships and we who venture upon your vast domain are required to pay homage, implore you in your graciousness to take unto your records and recollection this worthy vessel hereafter and for all time known as ‘Karma’, guarding her with your mighty arm and trident and ensuring her of safe and rapid passage throughout her journeys within your realm. In appreciation of your munificence, dispensation and in honor of your greatness, we offer these libations to your majesty and your court. We poured from the bottle overboard as instructed and then turned our attention from Poseidon to the gods of the winds (clearly hoping for fair winds and smooth seas from each of them). We called each by name, made tribute to each by pouring bubbles in their direction and toasting each one in turn. Oh mighty rulers of the winds, through whose power our frail vessels traverse the wild and faceless deep, we implore you to grant this worthy vessel ‘Karma’ the benefits and pleasures of your bounty, ensuring us of your gentle ministration according to our needs. Great Boreas, exalted ruler of the North Wind, grant us permission to use your mighty powers in the pursuit of our lawful endeavors, ever sparing us the overwhelming scourge of your frigid breath. Great Zephyrus, exalted ruler of the West Wind, grant us permission to use your mighty powers in the pursuit of our lawful endeavors, ever sparing us the overwhelming scourge of your wild breath. Great Eurus, exalted ruler of the East Wind, grant us permission to use your mighty powers in the pursuit of our lawful endeavors, ever sparing us the overwhelming scourge of your mighty breath. Great Notus, exalted ruler of the South Wind, grant us permission to use your mighty powers in the pursuit of our lawful endeavors, ever sparing us the overwhelming scourge of your scalding breath. We then shared the remainder of the champagne and laughed a bit at what we had just done. But somewhere in the middle of the ceremony (and the conversations that it brought up after) stirred up something very deep and very real that came out of the experience. A respect. For centuries sailors have been literally putting their lives in the hands of the sea (and the weather that fuels it), and we are about to do the same. We don’t take any of this lightly, whether it be the power and vastness of the ocean or the hugeness of what we have just done, and are about to undertake. Where we are and what we are doing isn’t lost on us for a single second. We feel such gratitude to have paved our own way in life, to have created a lifestyle where we have the freedom to make insane decisions like this one, and that we have been successful enough at all of it to achieve a lifelong dream we never actually thought could happen (much less to do so while we’re still young and able enough to enjoy and appreciate it all fully). Gratitude and respect. and of course, good Karma.